Only a small bit of graffiti can be found on the sides of the Krog Street tunnel now. 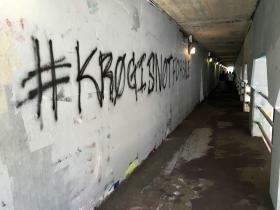 Northeast Atlanta’s iconic Krog Street Tunnel is looking a bit less colorful today. That’s after about 100 protesters spent Wednesday night covering with concrete-grey paint the constantly-changing piece of Atlanta’s graffiti culture. “I think artists were upset that their work was being used to promote and sell tickets to this party without any compensation to them,” said local artist Peter Ferarri, who was among those repainting the tunnel Wednesday night. The masquerade, a private, ticket-only event, is being put on by The Atlanta Foundation for Public Spaces. Described on its Facebook page as a “sultry underground event like no other,” the party will limit tunnel access for part of the weekend, and completely close it to both cars and pedestrians Saturday night. The lack of tunnel access is largely what’s upsetting neighbors, many who showed up Wednesday night. They’ve long vocalized their opposition. As WABE earlier reported, the event’s application went through the city’s standard event permitting process, including a hearing before the Neighborhood Planning Unit. NPU-N members eventually voted down the application. The city approved the permit anyway. Not long after it was clear the show would go on, no matter how much people objected, talks of protest-by-paint gained momentum on social media. Masquerade organizer Randall Fox says he knew of the plan, but he says protesters’ efforts won’t stop Saturday’s event. However the Krog Street Tunnel ends up looking Saturday night, artist Peter Ferarri says the plan is to quickly restore it. “So my guess is in the next week, you’re going to see some of the best art you’ve ever seen in that tunnel,” he says. Promoter Randall Fox says since Wednesday’s repaint, masquerade ticket sales have increased sharply. The original goal was to sell between 1,500 and 1,700 tickets at $40-$100 each. Fox declined to say exactly how many people have purchased tickets, but he tells WABE he expects final numbers will exceed the original goal.